the more you eat, the more you toot!" I know....I'm so mature. Ask hubs, he'll tell you about my embarassingly low-brow sense of humour. I think my brothers and I probably sang that tune on a weekly basis growing up...my poor parents. I still like beans....I like them in chili, I like them in curry and I even like them in salad....not so much hubs. He loves chili and curry, but offer him bean salad and he will scream like a girl* and flee to the basement, that safe man-haven of beer and wings. (*reaction may not be entirely as recounted; may be exagerration for comedic effect). Hubs does HATE bean salad though...in fact, there are not words for how much he despises it. It's too bad for him that I both love it and decided to make it tonight. We'd been having way too much meat lately, so I thought it was time to imbue a little vegetarian speediness into our lives (you can read that however you want). I went back to my current favourite cookbook, Cooking to Beat the Clock and found a wonderful four-bean salad that was exactly what I was wanting. This isn't quite the classic three/four-bean salad; it's got a little more sophistication (let's say the good old country favourite has moved to the city and wisened up a bit), and I found I had to add a little more vinegar to the dressing to really make it awesome, but it's deeeeeeeeelish. Normally, I use a 3:1 oil to vinegar ratio for dressing, but because beans are kinda starchy and bland, you can do a 2:1 ratio and it's much peppier. Highly recommend this as a vegetarian main dish you can whip up inside of 30 minutes. YUMMY. 1. Run the hot-water tap and put a healthy pinch of salt and 2 c hot tap water in a skillet. Cover and put over high heat until the water comes to a boil. 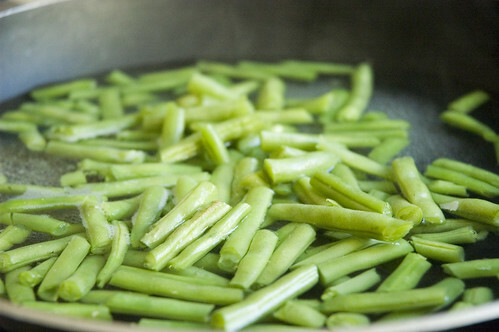 Meanwhile, fill the sink with cold water and trim the stem ends from the green beans. When the water boils, add the green beans to the skillet, cover, and cook for 3 minutes (if the beans are skinny) or 5 minutes (if they look more like me hehe). Drain into a colander and rinse with cold water to cool. 2. 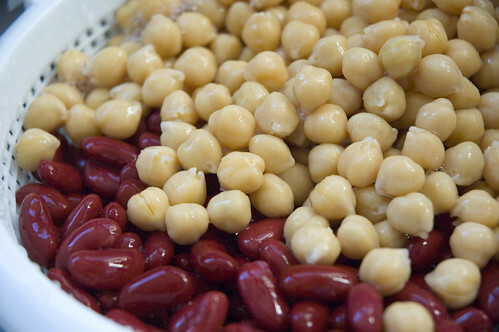 Open all the cans of beans into a colander, rinse and drain briefly. 3. While the beans drain, cut off a thin slice from the top and bottom of the onion, halve lengthwise, peel each half and cut crosswise into thin half-moon strips. Cut the tomato in half lengthwise, and cut each half into thin wedges. 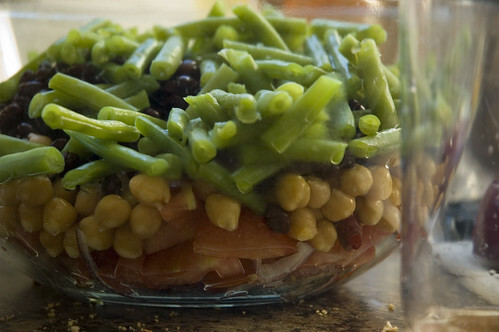 Put the canned beans, onion, tomato and green beans in a large bowl. 4. Peel the garlic and drop down the chute of a running food processor. When it is puréed, stop the motor and scrape down the sides of the bowl with a rubber spatula. Add the basil, vinegar, honey, mustard and salt and pepper to taste. Turn the processor on again and gradually pour in the oil through the chute. [I will confess that my food processor is still dirty from yesterday - I just used my immersion blender and pre-pressed the garlic]. 5. Add the dressing to the vegetables and mix well. To serve, place baby arugula leaves on the plate, and top with some salad. If desired, top with a little cheese (I like extra old cheddar, but feta or chèvre would be great). Thanks for reading! Love the comments! 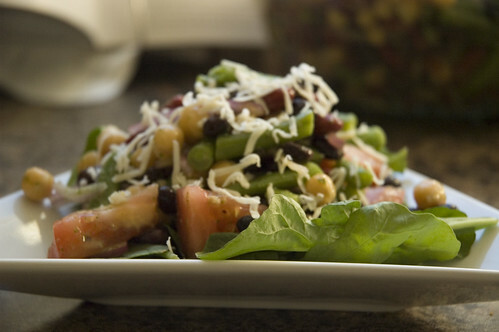 I love bean salad and this one looks so great. Honey and Dijon? Yum.